Did you know - In Central & South America, local dogs eagerly eat ripe Mangos as they drop from the trees. 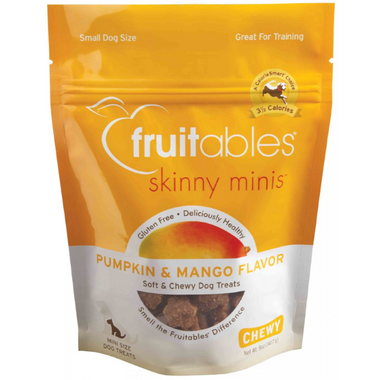 Fruitables' have taken this natural soft & juicy treat and combined it with fresh pumpkin to create these new chewy delights. It's like a Caribbean vacation in every treat. Ingredients: Pumpkin, Oatmeal, Ground Brown Rice, Tapioca Starch, Vegetable Glycerin, Ground Potatoes, Brown Sugar, Canola Oil, Ground Oats, Mangos, Gelatin, Cinnamon, Salt, Natural Mango Flavor, Phosphoric Acid, Sorbic Acid (a preservative), Mixed Tocophrols (a preservative), Rosemary Extract. My dog is on a vegetarian diet and adores these treats. She gets super excited when the bag is opened. Fruitables show that meat-free treats can be yummy too.